In 1906, Norwegian explorer Roald Amundsen became the first person to navigate Canada’s Northwest Passage entirely by boat, though not without considerable hardship: it took him and his crew of six three years to complete the crossing. Warming seas have since opened the once-impenetrable route to passenger ships, allowing for much more agreeable transits. 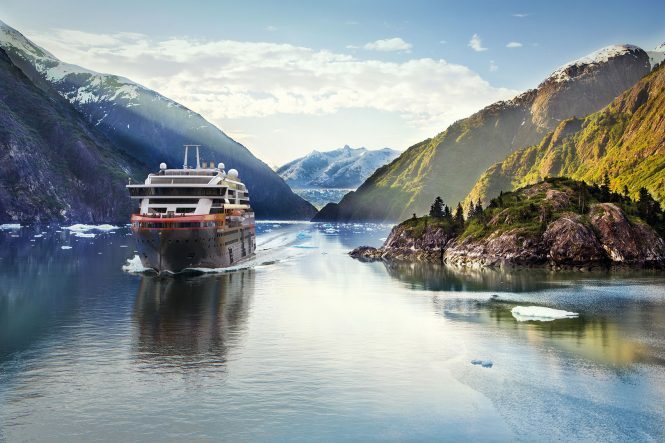 This summer, the most anticipated cruise of the season will be aboard the newly launched MS Roald Amundsen, which sails out of Greenland’s Kangerlussuaq Fjord on August 20 for a 24-day voyage to Nome, Alaska. The newest addition to the Hurtigruten fleet is also a first of its kind, with electric-hybrid engines that will allow the 265-cabin vessel to reduce fuel consumption and CO2 emissions by 20 percent. Passengers can also look forward to private hot tubs, a science center, and—for those who want to take in the passing scenery from the warmth of the ship’s atrium—the tallest LED screen at sea. More information here; from US$10,025 per person. This article originally appeared in the April/May 2019 print issue of DestinAsian magazine (“An Arctic Adventure”).